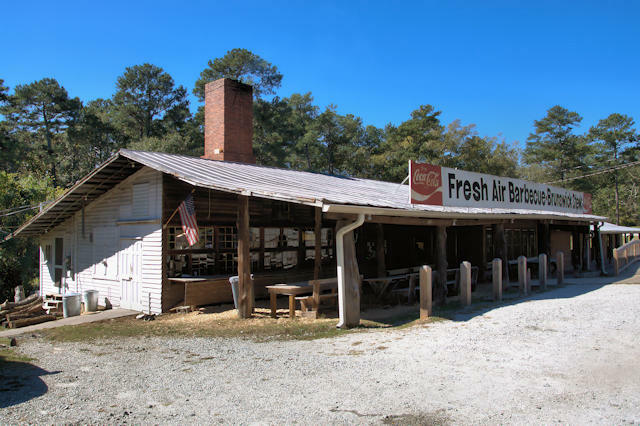 Dr. Joel Watkins began selling barbecue here in 1929, making it the oldest pit-cooked barbecue establishment in Georgia still in its original location. Upon Dr. Watkins’ death in 1945, the business was purchased by longtime manager, George W. “Toots” Caston, who is credited with making Fresh Air Barbecue into the institution it is today. Caston made improvements to the cooking process, the sauce, and the Brunswick stew recipe and expanded the business from a drive-in to a dine-in. 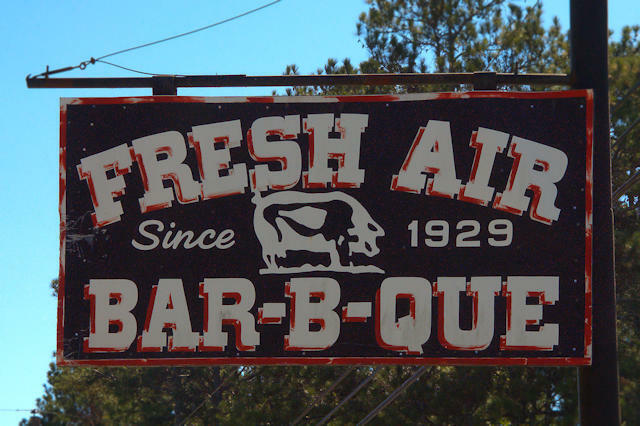 Even the coming of I-75 couldn’t keep people away from Fresh Air, with many travelers taking the exit just to experience the legendary fare of the “Barbecue Place”. Still boasting one of the shortest menus in the business, there are no frills here, just barbecue, Brunswick stew, pickles and potato chips, and pecan, lemon or Reese’s pie for desert if you need something sweet for the road. And you can buy a whole ham if you’d like. There’s a Macon location today that has a few additional items, but you really should go to the original first. Still the best I’ve ever had! And I consider myself a connoisseur. Great article but you failed to mention that Athens has 2 Fresh Air locations as well, for over 20 years now, started by Caston’s grandson. Have been to the original and just went to the one as you go in to Athens. Both are delicious! The original name was ‘Country Kitchen’. Love, love, love!! I have been to the original and in Athens. Awesome food!!!! Slight error in the story, Dr. Watkins, my uncle, didn’t die until 1952, he just sold the business in 1945. I remember visiting him when I was 5 or 6 and he always tried to give me baby rabbits, chicks or goats but my mother always vetoed it! He is buried behind Fresh Aire BBQ in the Watkins family cemetary on Watkins Pool & Park Rd which is on Thomas Wright’s farm. Also, the original restaurant served BBQ goat as well as pork. Raised in Jackson it is the standard that I compare all bbq and Brunswick stew to! Simply put it is the best!! I worked in Jackson growing up and Monday night was stock night They would always have us fried peach pies!